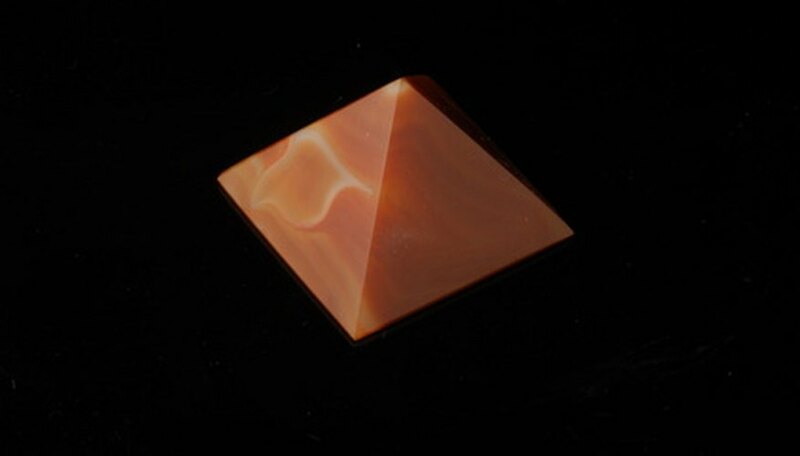 The Sardonyx is a gemstone that has been prized for its beauty and rumored metaphysical properties for thousands of years. Its name is derived from the Greek words "sard," meaning a reddish brown, and "onyx," meaning veined gem. A Sardonyx stone is a variation of onyx, which is a semiprecious stone of the silica mineral agate comprised of the chemical make-up SiO2. Onyx stones have the same properties as quartz stones. Sardonyx features many layers of quartz fibers stacked on top of one another that form translucent, opaque and solid banded colors over time. Sardonyx stones, also called banded agate, are onyx variations that feature distinctive red and brown bands of color in contrast to the sleek, pure black stones that are perhaps the most famous of these semiprecious gems. Sardonyx stones are easily identified by their alternating dark and light bands of flat white, gray, red and brown colors. This gem is perhaps most well-known as an August birthstone in modern times, but it was once more valuable than sapphire, silver and gold, and has been coveted by civilizations for thousands of years. Worn as engraved talismans by Roman soldiers, Sardonyx was believed to channel the attributes of the figure carved into the stone. During the Renaissance the gem was sought after by public speakers because it was thought to bring its wearer eloquence. Sherrard, Melissa. "What is a Sardonyx?" Sciencing, https://sciencing.com/sardonyx-7437615.html. 24 April 2017.